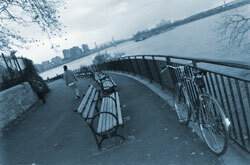 I walk over the foot bridge to a narrow park that is between the East river and F.D.R. drive, a 40 mph highway that outlines the east side of Manhattan. I can see our third floor apartment window. The red-bricked building looks exactly like the other buildings of the Jacob Riis projects except that it is much smaller. I can see my bedroom window that faces a parking lot and a much taller red-bricked complex. Con Edison’s power plant spans the blue sky with its three smoke stacks, where one stack is twice the size of my six-story apartment house. I came to where the park ends and three black cranes with their steam shovels scoop coal out of the barge and swivel to the opposite side. Empty dump trucks wait in line to be filled up with the coal that flows like dry silt. The barge rubs up against the piling from a passing tug.